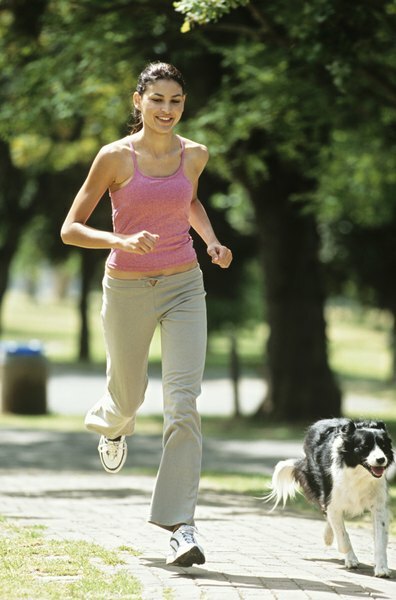 When you can't exercise with her, give your dog a safe, comfortable exercise run. An outdoor area where your dog can play safely -- especially if you don't have a perimeter fence, is good for your pet. However, without a roof, her run is going to get uncomfortable on hot or wet days, and she may go looking for a better place to play. Before making a roof for your dog's run, ask yourself what it is you want it for. If your dog is a 10-pound puppy or a 15-year-old with arthritis, chances are you don't need a roof to keep her in. However, very young and senior dogs may need extra protection from the elements. You also may want something different depending upon whether your dog only spends a brief time out in the run or stays there all day while you work. Analyzing what your dog needs will help you to make the best roof for her. If you have a sunny yard with no large trees or consistent shade, you need a shade screen at minimum. Dogs quickly can overheat and die just as humans can without protection from the sun on hot days. Nurseries and greenhouses sell a variety of shade cloth material in different weights to block varying amounts of sunlight. Choose the darkest possible for extremely bright, harsh areas or lesser weights to add light shade to areas already somewhat shady. Canvas or a dark tarp offer further options for shade cloths. Attach shade cloth with clips to wire or chain-link runs or tack it directly with nails to wooden framed runs. You also can use grommets, if available, to lace the edges over the frame of the run with rope. For dogs who spend a lot of time in their runs, a real roof is a good idea over at least part of the run. Treat the run walls as though they were house or shed walls and erect a lightweight wooden roof -- complete with shingles or sheet metal roofing -- over the top. Depending upon the weather you get, the roof can have a steep or shallow peak to shed rain and snow. You also may need to sink support posts into the ground at the corners to hold up a large or heavy roof. This is not a substitute for a dog house, however. Dogs need the companionship of their family and belong with you in your house most of the time. For those periods when you cannot be with her or when she needs some unsupervised outdoor time, keep an insulated doghouse inside the run, under the roof for her to lounge in as additional protection from the elements. Let's face it, some dogs just really like to climb. If your dog is an escape artist, you may need to build a whole-run roof to keep her in. Use the same material -- such as chain-link -- to tightly span the area from one side to the other and end-to-end. This is not a substitute for shade or weather protection. You still will need to put one or the other of those over the top of the run as well, but it will stop your dog from wandering the neighborhood when you aren't looking.